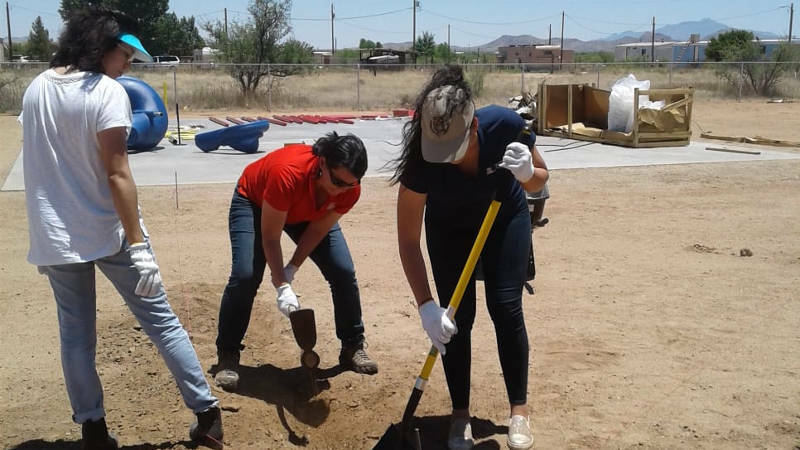 On June 18th, 11 students from the FRONTERA program organized by SEAHEC and the University of Arizona’s College of Medicine, visited Winchester Heights to begin construction of the Burris Children’s Memorial Park playground and install the insulation in the community center building raised this past spring. The interns eagerly began working on Monday morning, installing insulation in the community center’s facility, unpacking the playground equipment and breaking ground for the installation of the playground. They helped each other work under the hot summer sun, taking turns breaking the ground and shoveling dirt. They became acquainted with the needs of this small, underserved farmworker community and were a part of building an important safe space where Winchester Heights children and [adult members of the community] will spend time together outside and exercise. The Focusing Research on the Border Area (FRONTERA) program hosts students from diverse backgrounds who are interested in health professions and immerses them in the world of border health while they work on a research project on the topic. The interns worked alongside a community member and her children, SEAHEC Director and staff, and the Construction Project Manager. They became acquainted with the needs of this small, underserved farmworker community and were a part of building an important safe space where its children and parents will spend time together outside and exercise. It was an important experience for these future health professionals to gain a broader understanding of what health encompasses outside the clinical setting. The Winchester Heights Community Center construction project is part of a larger health initiative known as Healthy Farms, launched by SEAHEC in 2009 to improve rural access to health information and services. Initially, the program was aimed at farmworkers in Winchester Heights, with the goal of establishing a team of farm-based community health workers (CHWs) who would provide health education, and links to distant health and social services, as well as providing a liaison to growers to help them improve health conditions in the work place. However, the initiative has grown and evolved in response to community identified priorities. As the community improved its capacity to collaborate on identifying, prioritizing and addressing health issues, an increasing amount of data pointed to a long-standing need for basic infrastructure needed to support public health. Residents expressed specific needs that incorporated, urbanized communities take for granted: Clean water, clean air, paved streets, decent housing and a host of similar issues all with roots in lack of basic infrastructure. Most of all, the community lacked a common space to meet, plan and implement community improvement projects. For instance, SEAHEC’s community health workers were holding training workshops in neighbors’ living rooms. The ability of large groups to meet to work on development issues was non-existent. SEAHEC helped residents assemble a coalition of community partners to develop resources needed to build the community center and playground, which include the Legacy Foundation of Southeast Arizona, The Arizona Community Foundation of Cochise, Cochise Health and Social Services, the county health department, Chiricahua Community Health Centers, Inc., The Community Food Bank of Southern Arizona, Project PPEP, Inc. and others. Unsurprisingly, the infrastructure deficits Winchester Heights residents face are not uncommon in the Southwest. 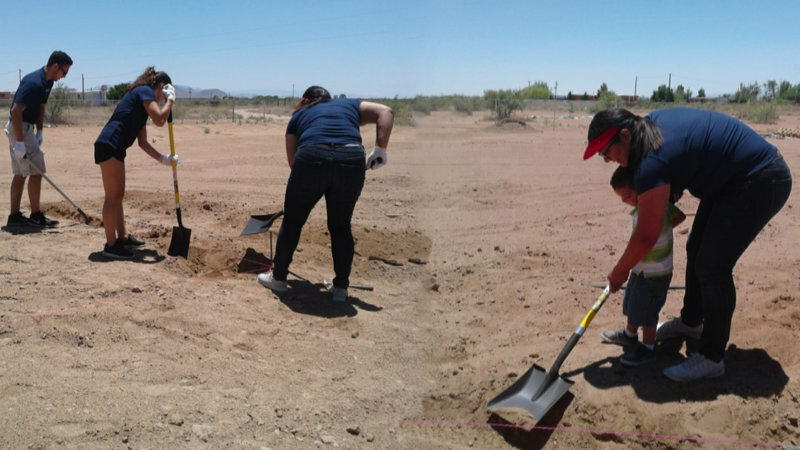 Nearly half a million people in Arizona and New Mexico alone, live in unincorporated neighborhoods designated as colonias: rural communities within 150 miles of the US/Mexico border whose main characteristic is lack of infrastructure needed to support public health. SEAHEC’s Healthy Farms Program provides a replicable model for addressing root causes of the persistent public health problems colonia residents face: Lack of community capacity to address infrastructure deficits. At the same time, Healthy Farms’ training opportunities for health professions students and community health workers helps to build our rural health care workforce. Tagged frontera, Summer 2018, winchester heights.